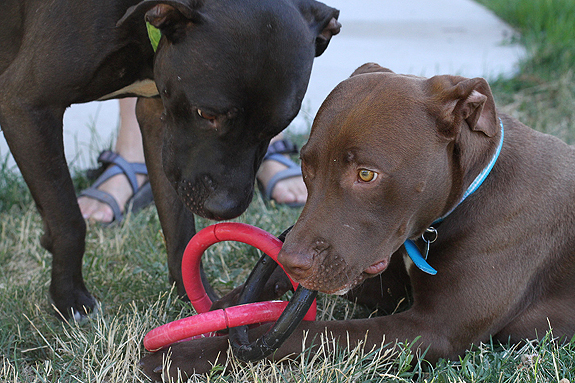 Group dog walks, play dates, classes, doggie daycare and dog parks were all among some methods used to social your dogs, and an all-time favorite … fostering. Eclipse has been going to the local tavern with us since we brought her home as a pup. A bowl of cool water for her, some cold beer for us, and plenty of people and fur-buddies to meet and greet. I love going on group walks, fostering other dogs (gives my dogs great experience with other dog personalities), supervised play sessions and going to training class. Dog parks can be a lot of fun, too! Sadie goes everywhere with me, so she gets socialized in a lot of different ways. But her favorite by far is in obedience classes. Fostering! We foster for a local rescue ‘Bullies In Need’ and our formerly nervous and reactive dog gained so much confidence by fostering! We’ve had over 12 foster dogs come through our home so far, and with our careful selection to match our Sasha with very social dogs, she has had only positive interactions with them. We couldn’t be happier and now she’s a much more calm and comfortable companion that loves to have fun with all of her dog friends! Going to classes! It gives them a chance to practice focusing in distracting environments, and a controlled play session afterward with dogs that work well together. We love our local dog park, but usually we take her to the main city park so she can be around people, dogs, and kids (really noisy kids, at that). She loves it! Going on pack walks with our neighborhood rescue, Pit Stop Bully Rescue in Tampa. My dog loves the long walks and meeting his pack members at the end, when everyone is tired, ensures that the dogs are more mellow. He’s made many new friends and we have bonded even more. I can tell he’s super happy because he passes out when we get home and a tired dog is a happy dog. 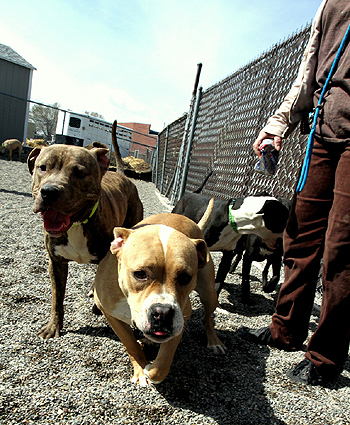 Doggie daycare, but it really is hard finding one that will take a pit bull. Fostering dogs in my home and taking her to daycare. Pittsburgh has some amazing doggie daycares that do not discriminate against pitties and that actually even foster dogs for the local shelters! One of the big things my wife and I wanted was to make sure our dog is well socialized. Before Petco changed their policy, Mocha would go to the playtime on Saturday morning (now it’s limited to puppies 6 months and under). After the policy change, I try to get her to the dog park at least once a week. She also plays with the neighbor dogs, and goes to day care at least once a week. I walk her almost every night, so she can learn to behave around other dogs and so she can meet people. 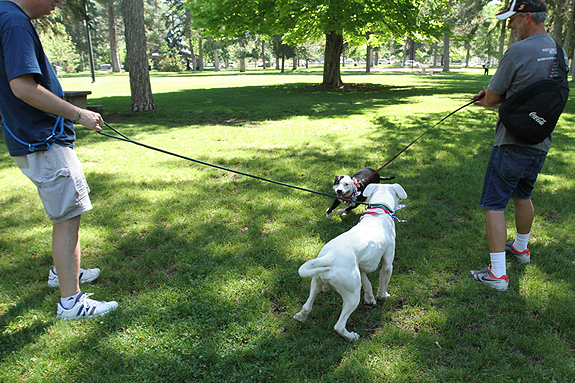 We do weekly pack walks with our dog socialization group in Kansas City! Today I went to the dog park for the first time with Skye, and it was great! We had always socialized off leash at the beach or hiking but I had avoided dog parks for several reasons. Today we were going by and I figured I’d give it a try- it won’t be a frequent thing, but I’m glad it was a good group of people and dogs. We tried the bark park, but my dog is so people-oriented, he just wants to jump up on the benches and kiss their faces. Then they freak out and scream, which scares him. So for now, we are limiting his socializing to supervised play dates with dogs belonging to friends and family. They all love him. I like sitting at an outdoor cafe with Mocha as long as she doesn’t try to steal the food! 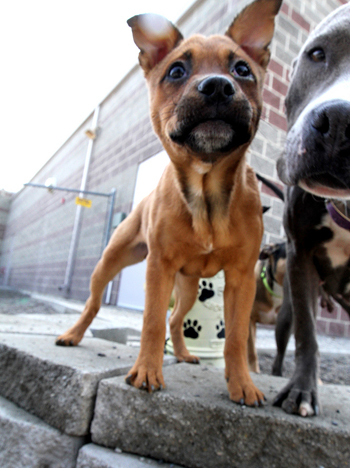 Doggie play dates! I keep my girls socialized often. I would host dog play dates with other people’s dogs (friends, relatives, friend of friend, etc). Isis and I go to the dog park to run, jump, bark, and play with other doggies. She’s still smallish at 6 months old, but she holds her own with the big dogs! When she was younger, we went to puppy play dates so she could socialize with other puppies. I take Laz to the shelter where I volunteer and he gets to meet some new friends and romp and play in the fenced in their park and the shelter dogs get to socialize too! Win, win. We also go to the local parks, but not so much to socialize, we practice our waiting as other dogs go by. I foster, so the two dogs of my own get to meet different dogs. Also I do a doggy drill team with one of them. If I’m not working my dogs are usually always with me, whether it’s visiting friends or out getting groceries, so they come into contact with other dogs on a daily basis. It seemed to help. My pit bull loves all other dogs that she has met so far. During the off season I take my bull to the beach so he can walk the boardwalk and run away from waves. 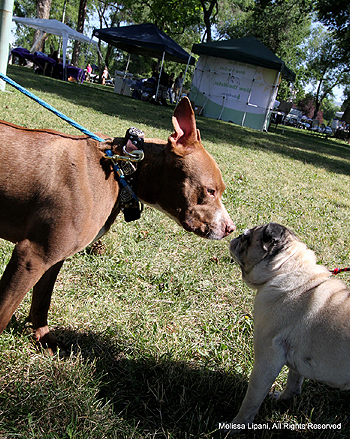 Just about every person we meet shares their own pit bull story and get a kick out of my love-a-bull Biff. We try and expose Juno to as much of the world as we can, so we take her everywhere with us. We go to the dog park as much as possible and we even attend group training once a week for life. My three dogs and I go to the dog park. I’ve only had my two younger rescue-dogs for a short time, so while there we practice recalls, sit, lie down, and some tricks. Socializing them also means not allowing them to get too overexcited when they’re playing with some of the wilder dogs. 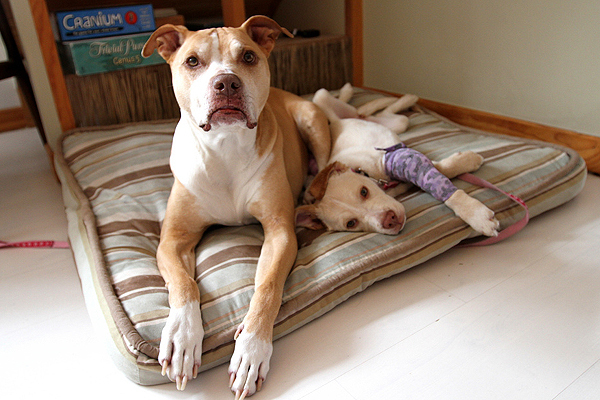 But they’re learning to meet all kinds—and also learning to trust me to extricate them from difficult situations. Usually play dates with friends dogs or if we meet a friendly dog on a walk. 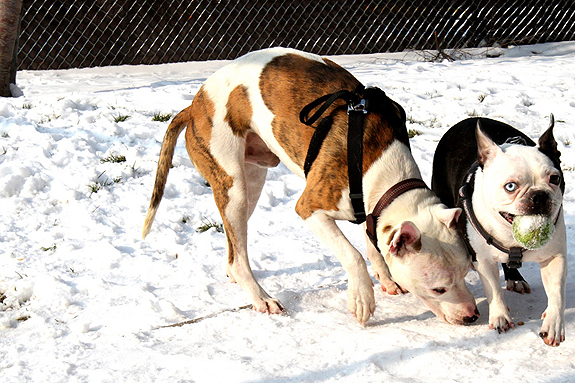 We do Bully Walks once a month with or group. Those dogs that are not yet used to outings wear a red bandana to remind others to be respectful. 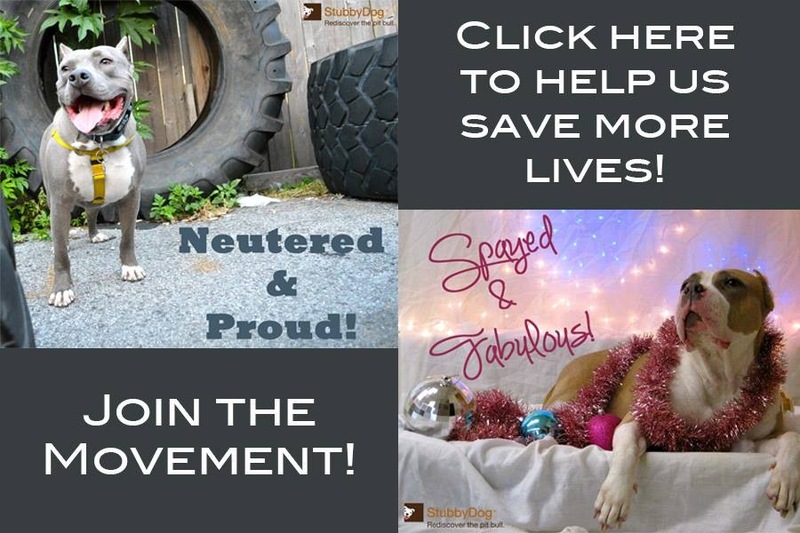 We use these walks to advocate for our breed by getting people used to a large group of all different kinds of people having fun with their beautiful dogs, that happen to be pit bull type dogs. We go to the dog park almost every day. At least five days a week, and at least one day a week of doggie day care. I socialized my girl young with friends’ dogs, then progressed to the dog park when she was old enough. I also foster a lot of dogs, so she’s learned how to easily accept new dogs as part of our pack without a problem. We take them to PetSmart and the dog park as often as possible. I also take them on vacations and camping, charity dog walk 5Ks, stuff like that. Our pit Bernie goes everywhere with us, we dog sit for friends a lot and since we rescued him he comes with us, it has been a great way for him to meet other dogs, also occasional dog park visits can be fun, but I really find the dog park fun depends on what people and dogs are there. Most people who meet him love him, but we do encounter some prejudice in this area. Horse shows. We go to weekend-long three day horse trials all over the area, pretty much every weekend starting in April with the Rolex show in Lexington, KY and ending with the Dunnabeck Horse Trial in Carbondale, IL in October. We camp, we walk around all day long and Mr. Roscoe has a blast. Everyone brings their dogs, dogs of all sizes and shapes. He’s also perfect with the horses. And the kids!! I found some dog social dates through meetup.com. We went to one just for puppies at a training facility and another for all aged dogs at a daycare center. Both were free! We’re also going to be starting group dog walks soon (also from meetup). Bringing home dogs that are currently being boarded through our rescue for play dates. they are so sweet! especially the brown one in the second picture – what a cute little thing!